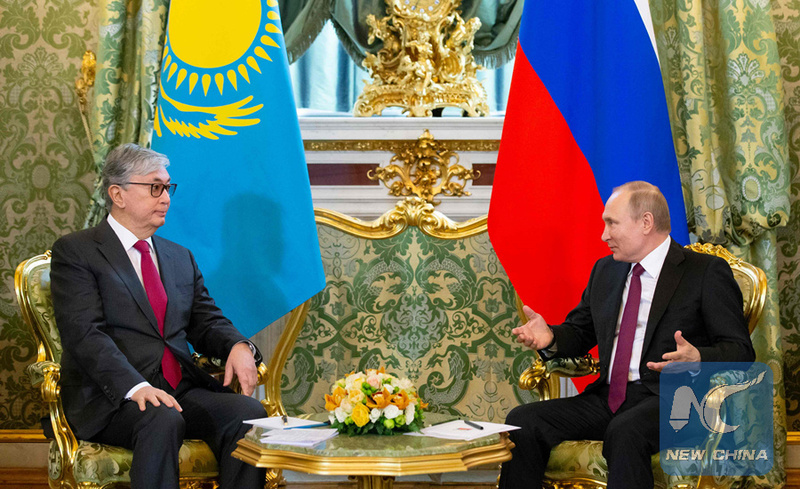 MOSCOW, April 3 (Xinhua) -- Russian President Vladimir Putin and visiting Kazakh President Kassym-Jomart Tokayev on Wednesday agreed to further develop the strategic partnership of the two countries and enhance their comprehensive cooperation in various fields. The two leaders discussed at their first meeting a wide range of key issues on the bilateral agenda, according to a joint statement of the presidents published on the Kremlin's website. "Acknowledging the importance of a substantive and open political dialogue for the dynamic development of relations between the two states, the presidents advocate the further expansion of trust and constructive contacts at the highest levels," the statement said. Tokayev, succeeding his predecessor Nursultan Nazarbayev, was sworn in as Kazakhstan's president last month. He made his first official foreign visit to Russia, Kazakhstan's close ally. During the talks, Putin and Tokayev spoke in favor of expanding multidimensional economic and humanitarian relations and strengthening interaction between business communities, educational and scientific circles as well as legislative and executive authorities, according to the statement. Meanwhile, the presidents said that their countries will continue to closely cooperate in strengthening regional and international peace and stability, such as facilitating the Syrian peace process and countering international terrorism. Following the talks of the presidents, a number of bilateral documents were signed in the fields of gas supply as well as industrial, scientific and technical cooperation, according to the Kremlin. "The heads of state stressed that the fruitful negotiations and bilateral documents signed during the visit will contribute to the ongoing development of the traditionally friendly, equal relations between the Russian Federation and the Republic of Kazakhstan," the statement said. Kazakhstan and Russia are founders of the Eurasian Economic Union, and also members of the Shanghai Cooperation Organization and the Collective Security Treaty Organization. Russia uses the Baikonur Cosmodrome in Kazakhstan to launch its spacecraft.